Dangerous Driving Impacts Your Car When speaking of reckless driving, we usually mean an aggressive style some drivers assume for driving faster and cooler (at least they seem to believe it). This dangerous driving often results in collisions and other kinds of traffic accidents leading to damage, injuries, and even deaths. 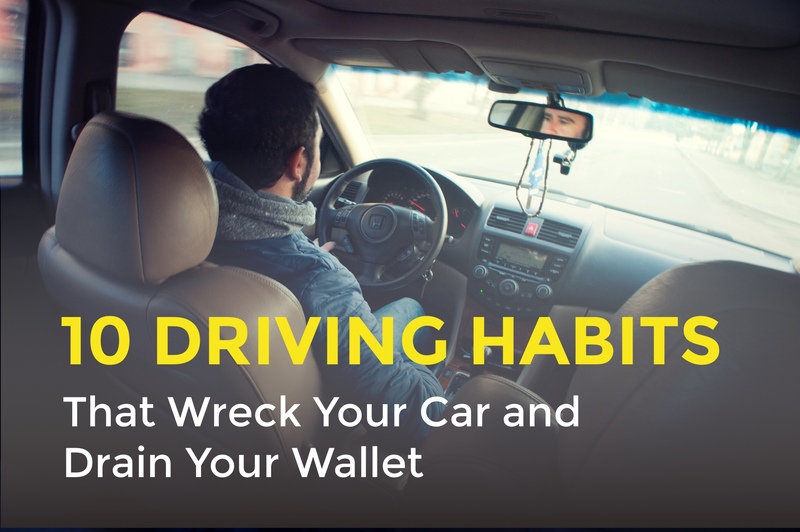 But in fact, some unobvious bad driving habits can result in both wrecking your car and risking your life, and you will hardly be happy to spend a fortune on changing and repairing parts and units that could last longer. So, we are here to tell you about bad habits you should quit and to give you some tips on good driving habits you should form instead. Dirt, impurities, and residuals – all of these accumulate in the bottom of your gas tank and then can be absorbed by the fuel pump when the fuel level is low. This shortens the life of the pump and filters, especially if your car features a direct-injection engine. Definitely, riding on an almost empty tank is not among good driving habits. Though today’s engines don’t require much warming up, this cannot change the laws of physics - different alloys inside your engine have different thermal expansion rates, and thus you need to give them some time before shifting to high-speed engine operation. Otherwise, all those cylinders, liners, and pistons will rub and wear out. Usually, they try to inform you about malfunctions in the main vehicle systems to prevent the worst and the most budget-unfriendly case scenario. Good drivers won’t ignore these signals, and either will follow control lamps instructions or at least will visit a car service center. If your car is equipped with an automatic gearbox, you might forget about your hand-brake, always using the Parking option. But this is quite a shortsighted approach when parking on a hill since the entire load falls on a lock in an engine output shaft, which wears out faster. This is one of the worst driving habits since it is both costly and unsafe. You need to steer clear of other vehicles, leaving enough space for safe driving, instead of applying your brakes frequently. If you continue to drive dangerously, you are sure to spend a fortune on changing brake shoes and disks, not to mention a higher risk of collision. As a safe driver, you might keep your foot on the pedal to brake if it is necessary. But this leads to the brake overheating and wearing out. You’d be better off switching to a lower gear to use engine braking. Back again to manual transmissions. It seems that the earlier you change up, the lower the engine rpm at the same speed, which usually means lower fuel consumption. But we have placed this among bad driving habits, since, when driving the car at a low rpm, your engine has to works with increased load under reduced pressure in the lubrication system – and this is really bad for its durability. When you cut off your red-hot turbocharged engine without running it at idle speed, you trigger boiling and then coking of automobile oil in your turbine, shortening its life. It is recommended to allow the engine to run without load for a minute to cool it down after speeding. Driving an overloaded vehicle, as well as a subcompact car or city hatchback with a trailer is not on our list of safe driving habits. Exceeding vehicle capacity is both dangerous for you and wearing for your car systems - engine, transmission, suspension, steering, and tires. Know your car capacity and don’t overload it, while using trailers only with heavy off-roadsters, wagons, and pickup trucks. Don’t forget to release the pedal every time after depressing it for shifting the gears. If you don’t, this will lead to clutch release bearing and diaphragm spring wearing out. Even if the weather is warm, wait a couple of minutes after starting the engine to allow the oil to distribute inside the transmission. Check tire pressure routinely to avoid both damaging rims and dangerous driving when the wheels are not gripping the road. Be better off without aggressive driving like hard acceleration and braking, turning with a tire squeal, fast changing of lanes, since this results in fast wear and tear of the tires and brakes, as well as a shorter life of suspension, engine, and transmission. Avoid road bumps and cracks that can damage your car and be careful when parking curbside, since your tires, hubcaps, and even steering column can be wrecked. Timely preventive maintenance is a great approach and one of the best safe driving habits you can acquire. Keep your car happy and don’t have it let you down on the road!